I'm a fan of retro gaming. My memories of early home video games are filled with brilliant animation, amazing sound, and engaging plots. But when I look back at the games now, there's a little something missing from most of them -- it's more bleeps and bloops than I remembered. Let's take a stroll down memory lane with some Atari 2600 titles I played in my neighbor's basement...and a few I wish I had. Look, I have a few fond Atari memories, but this is not one of them. I mean, come on. The graphics glitches here are beyond absurd (the ghosts must "take turns" appearing on the screen, hence their constant flickering), and the sound effects make me want to gouge my ears out. This game is infamous for being a crappy port of an otherwise excellent arcade classic. Here's a 34-second run through of Adventure on its easiest setting. Yes, this game involves dragons, though I always thought they were giant ducks. The hero is simply a square. Pitfall! has a special place in my heart. It was really hard, and it actually had a lot of depth for its era. In this video, a player shows us a typical game. Although I played this at the time, I don't remember all these flickering-sprite problems (similar to Pac-Man above). 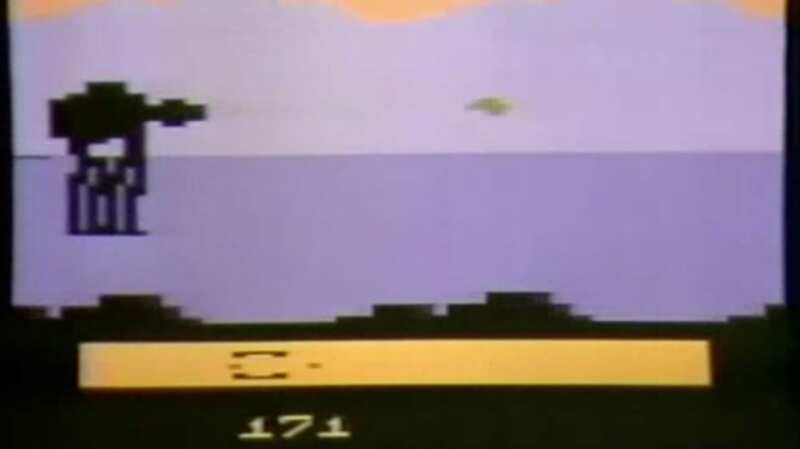 The technical limitations of the Atari 2600 were severe indeed. Here's a brilliant example of using the limitations of the system to make a fun game. The glitchy graphics are all intentional, and add to the sense of creepy madness. Even the sound effects are moody, despite being primitive. If you don't get what's going on here, read the Wikipedia page. Each AT-AT Walker had to be hit 48 times to destroy it. "Whenever you hear the Star Wars theme, the Force is with you!" This is from "How to Beat Home Video Games," a retro goldmine. Although I never played this as a kid, its crappiness is legendary. (Reportedly, unsold cartridges were buried in a New Mexico landfill.) Just imagine popping this into your 2600 and...enjoying...falling into holes over and over for some reason. If you like this game, check out this guy's six-part explanation of why he loves it. Let's end on a high note. I remember being completely entranced by Joust -- you got to ride a flying ostrich and fight computer-generated guys flying ostriches. What's not to love? Share your Atari 2600 memories in the comments, and include a video link if you've got one. There's a lot of this stuff on YouTube, folks.